Julien Hug from Exotiq Property Bali is offering this 6-villa estate for sale in the heart of Seminyak, walking distance to the beach and world class restaurants. The estate has two x 2-bedroom villas with private swimming pools. All villas are all comfortably furnished, with stone floors, high pitched ceilings. A colonial sense of style in well maintained tropical gardens are ideal for Seminyak's holiday rental market. Well appointed and spacious bedrooms throughout. Semi-open lounge and dining areas with a colonial style ambiance. Three bedroom villas are a perfect holiday home for families and friends. With a combined area of 3,406 square metres of land and 1,177 square metres of floor space this 6-villa estate has been built in a mix of contemporary and Bali styles. The estate consists of 2 x three-bedroom villas, 3 x two-bedroom villas and one single-bedroom villa - all comfortably furnished, with stone floors, high pitched ceilings and a beautiful colonial feeling throughout. 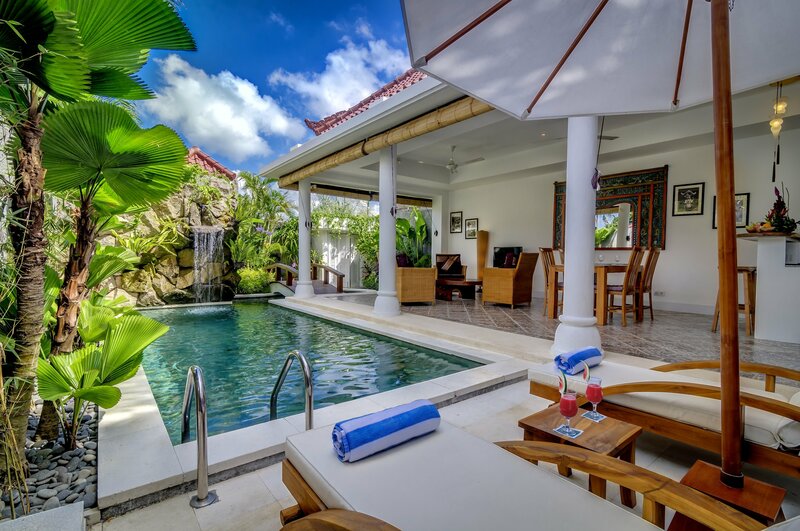 Julien Hug told WILLIAMS MEDIA "All villas are self-contained and have private pools, water features, tropical gardens, private entrances and onsite parking. Easy walking distance to the beach, these villas are also close to the many great restaurants, bars and shops of Seminyak." "The business is being offered fully staffed by a long-standing team of professionals and with a leasehold valid until January 2039 with a 25-year option to extend," says Hug.